Yeah, ok, I'll admit it. This layout is pretty similar to the Dragon Age layout I made for my own site XD;; Though, I think this one has a darker feeling to it because of the color scheme. 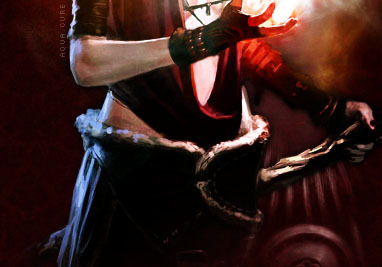 This features a couple images of Morrigan I found on the official Dragon Age site. They're both concept art, which is why it doesn't totally look like her. This layout also uses Google Web Fonts, so you don't need to upload any font files. Just make sure you don't remove the stylesheet tags.